Glam Chops is a Glam band that I am in. We played last night. I think it went quite well. Especially considering I've pretty much been out the country since October and we'd not had a chance to rehearse. It was the first time we'd ever played our Christmas song live. We released it last year as a download for free. As we thought it might cheer people up in the bad economic climate. We are still in a bad economic climate. So it is still free. It's the second Christmas single I've been apart of. I was on Black Box Recorders song 'Christmas Number One' two years ago. Im a bit sad that I was too busy with Art Brut/Everybody was In The French Resistance...Now this year to record a christmas song. I think to make it up I want to record an entire Christmas album with Glam Chops for next Christmas. I've just got to convince the rest of them its a good idea. 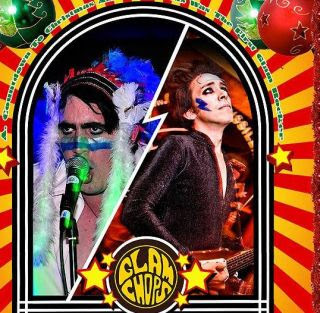 Funnily enough Tim thinks a Glam Chop Xmas album is an EXCELLENT idea! uh-oh!!!! My entire Xmas will be dotted with 'honey honey listen to this! Hey Hey Hey Snow Snow Snow' etc etc. Have a nice Xmas Eddie! Excellent thanks for share, this guys were really great on that times, I don't know why they stop singing.